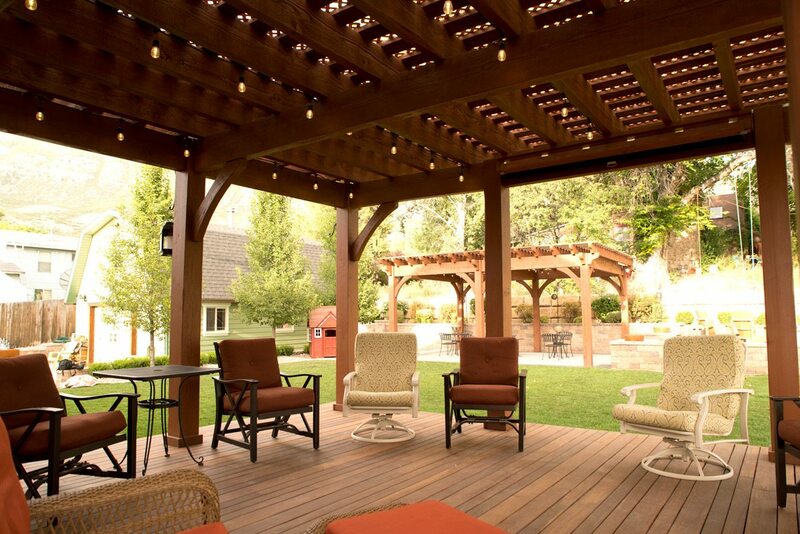 String lights hang from a lattice roof of a Western Timber Frame™ ShadeScape™ 8000 Series pergola kit installed for shade over a solid wood deck in Pleasant Grove, Utah. 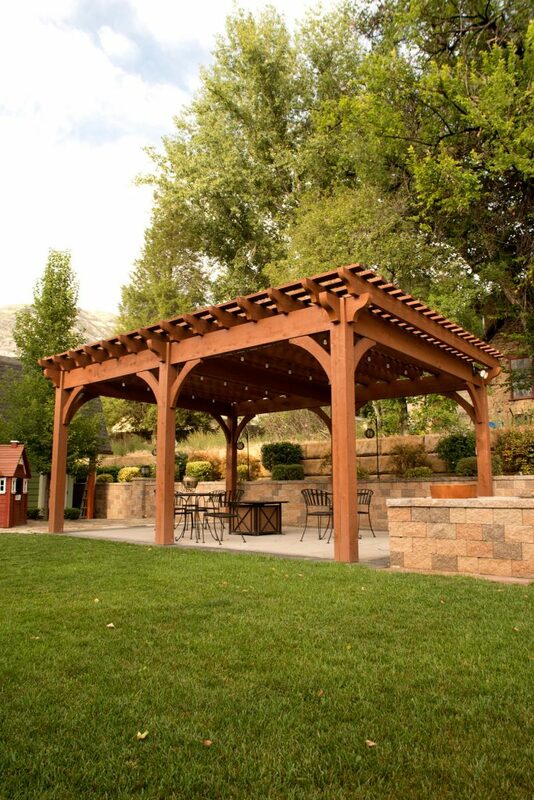 Example of a Western Timber Frame™ ShadeScape™ 8000 Series pergola kit installed for shade over a backyard patio in California with cantilever roof facing house. 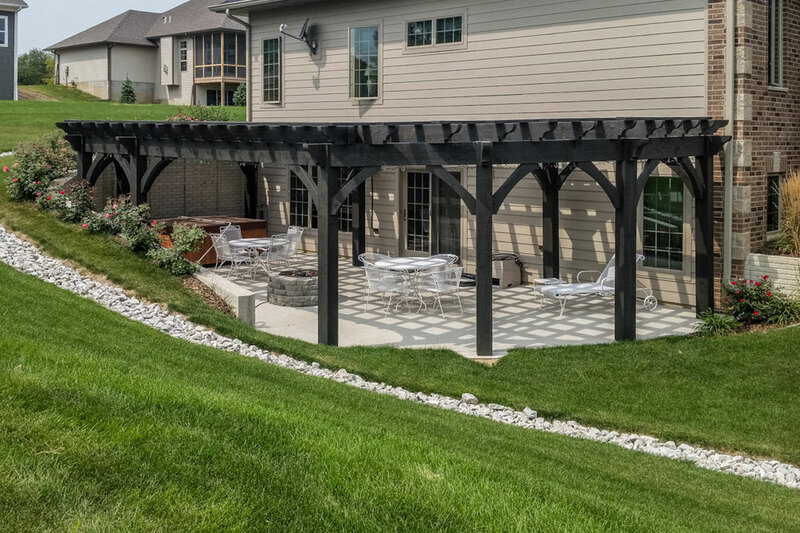 Enjoying their timber frame pergola so much, the family decided to have a second pergola installed in the backyard of their beautiful Pleasant Grove home for a covered deck. 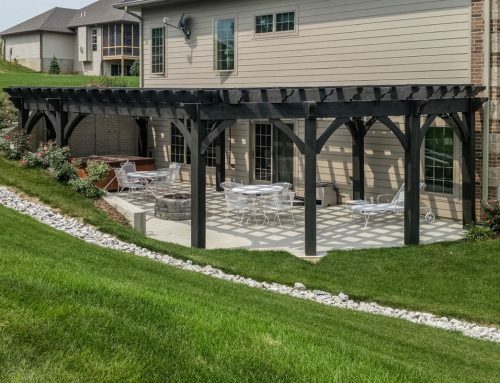 The timber frame pergola in the foreground is an 18′ x 27′ ShadeScape™ 8000 series installed previously over a concrete patio for an outdoor dining area. 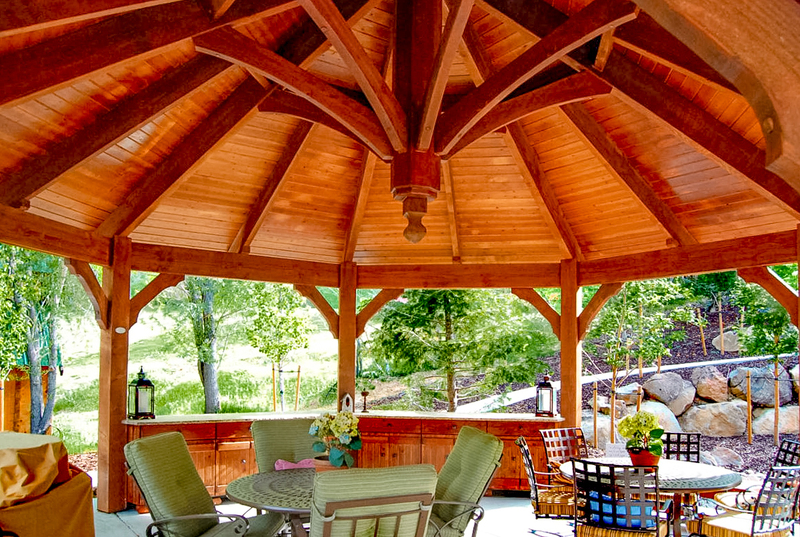 The timber frame pergola installed over the solid wood deck is made from Douglas-fir and finished in a premium high-grade, Rich Sequoia satin stain matching the first installed pergola. 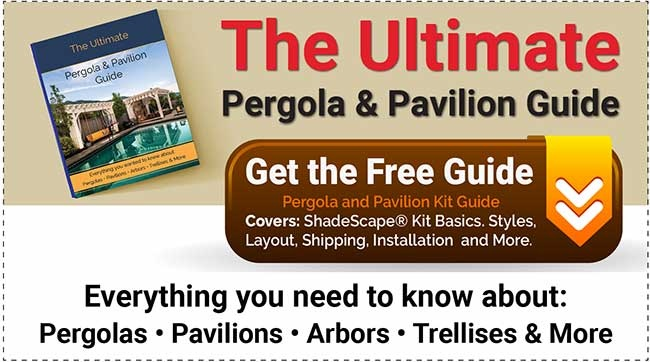 This free standing timber frame pergola kit is also an 8000 ShadeScape™ series with a very unique style. 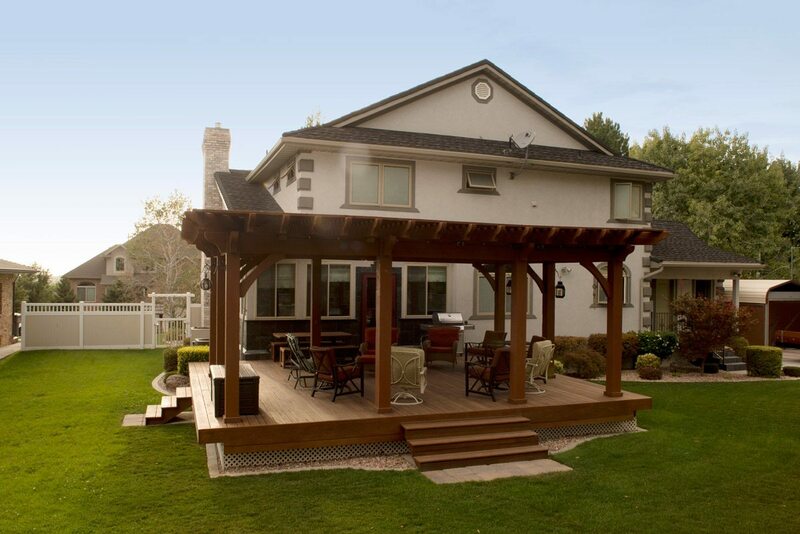 It features a gorgeous cantilever FullWrap™ around latticed roof that faces the home. Pictured left is an example of a ShadeScape™ installed featuring a cantilever roof that faces the home. 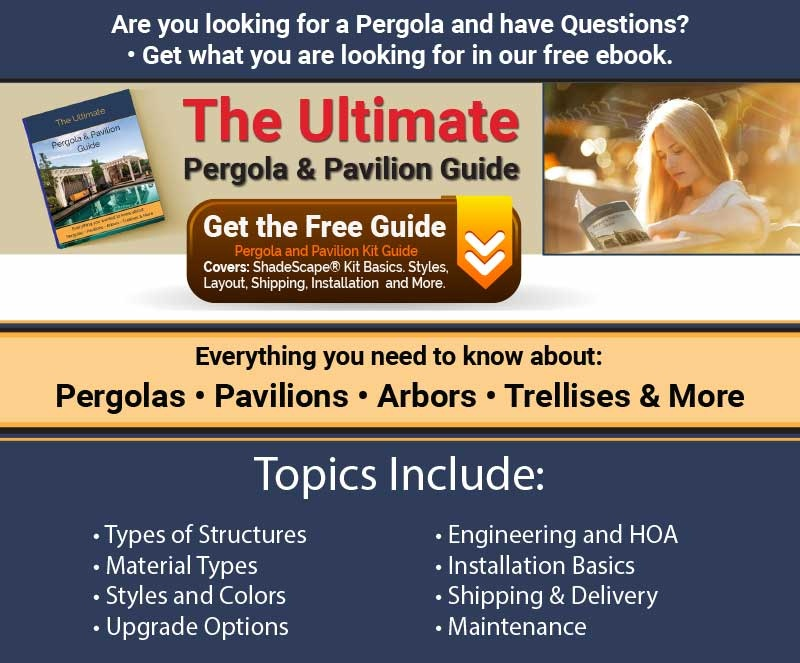 Depending on the layout and the use of the pergola, a cantilever roof is not only aesthetically pleasing but allows the posts to be placed for the most useable room with a greater amount of shade. Pictured below is an excellent view of the cantilever roof as it extends out facing the house. 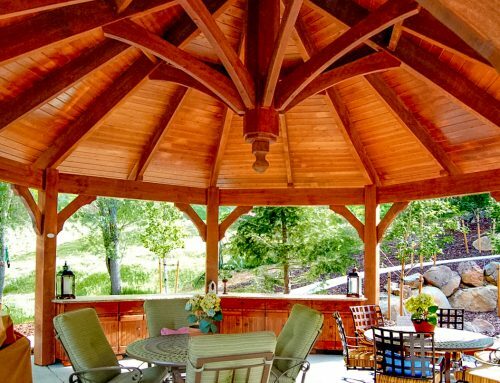 The FullWrap™ around roof features Roosevelt style beam and rafter end profiles for a perfect finish from every angle of the pergola. 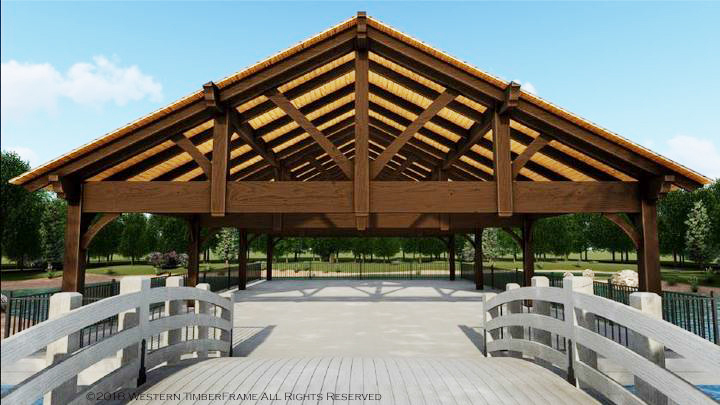 Western Timber Frame™ ShadeScape™ 8000 Series pergola kit featuring a FullWrap™ around roof with a cantilever roof. 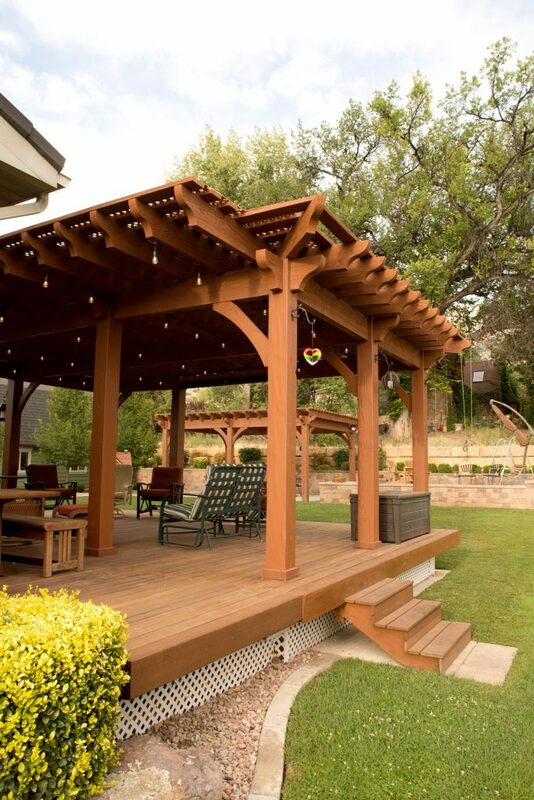 On the top is the lattice covered roof for additional shade that ties in with the latticed deck. 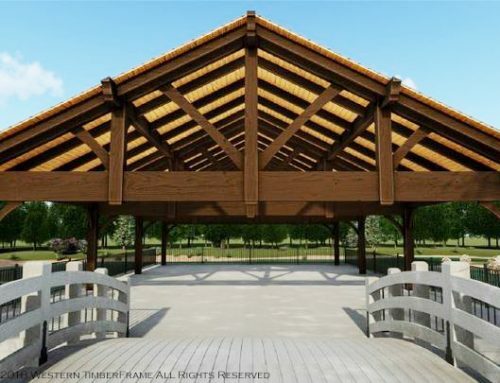 This is a Douglas fir, 21′ 2″ x 27′ Western Timber Frame™ ShadeScape™ 8000 Series timber frame DIY pergola kit with a 15′ 2″ x 23′ footprint (post-to-post) featuring Classic style knee braces and as mentioned, Roosevelt style beam and rafter end profiles finished in a premium, high-grade, UV protective Satin Rich Sequoia exterior timber stain. The posts are 12′ high and from the deck to the bottom of the lowest beam is 10′ 10″ giving it a wonderful, almost cathedral-like ambience. 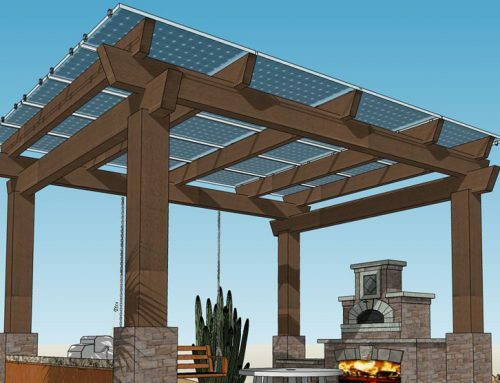 The pergola is drilled for power with an additional outlet and light switch. 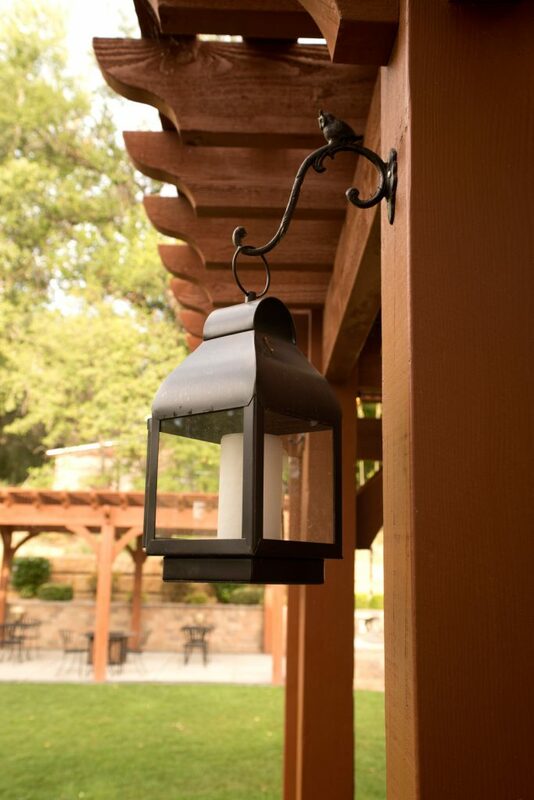 Metal candle lanterns offer romantic lighting at night and give a nice stark contrast against the Rich Sequoia stain. 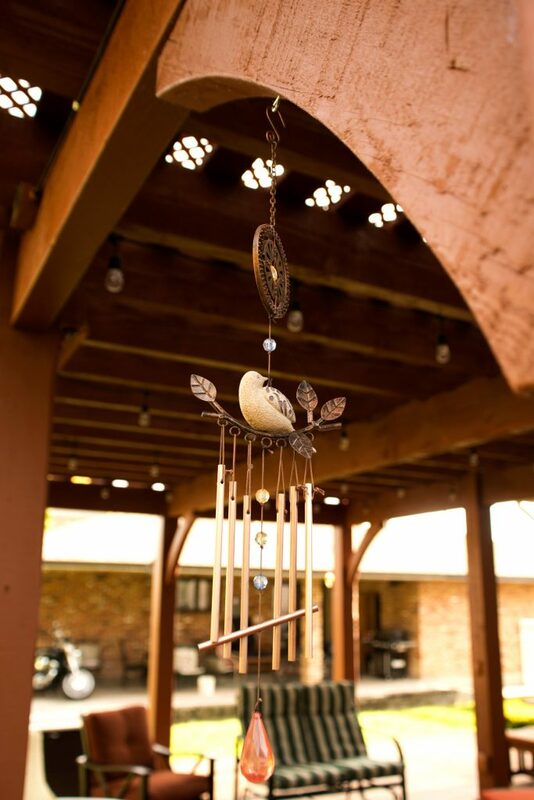 Behind the wind chimes you can catch a glimpse of the lattice roof that creates such an elegant shade pattern. 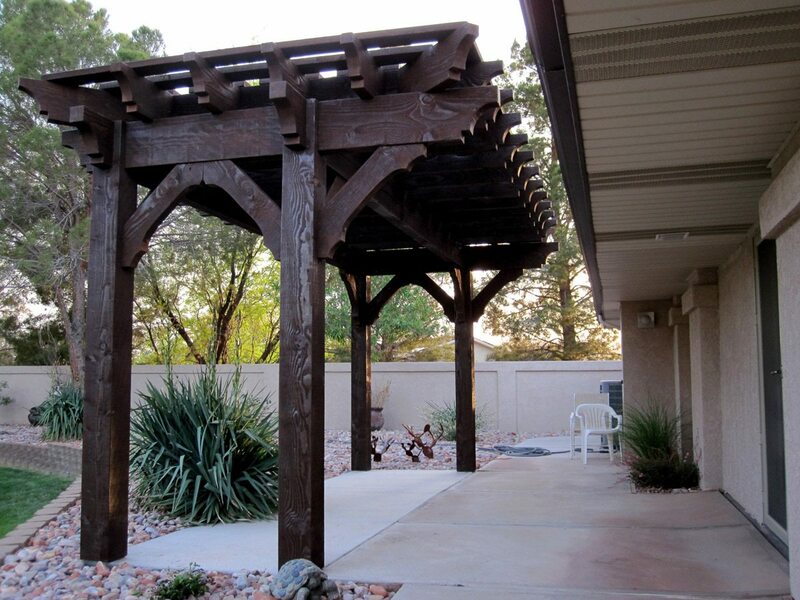 Timber frame ShadeScape™ 8000 Series DIY pergola kit installed over backyard solid wood deck. 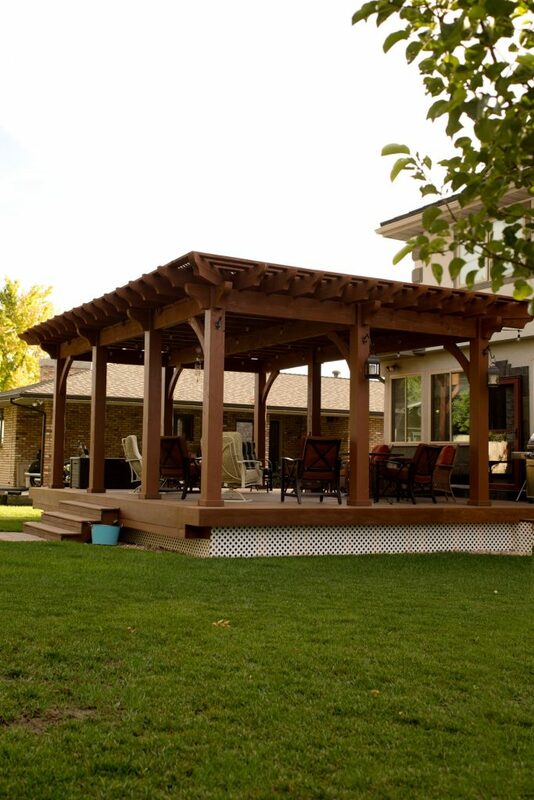 Front view of the ShadeScape™ 8000 Series DIY timber frame pergola kit installed for shade over the backyard solid wood deck. Here is a great view of the FullWrap™ roof, the Roosevelt style beam and rafter end profiles wrap around the entire structure. Here again from the backside is another great eye-catching view of the FullWrap™ roof with the Roosevelt style beam and rafter end profiles as it curves around into the cantilever roof. 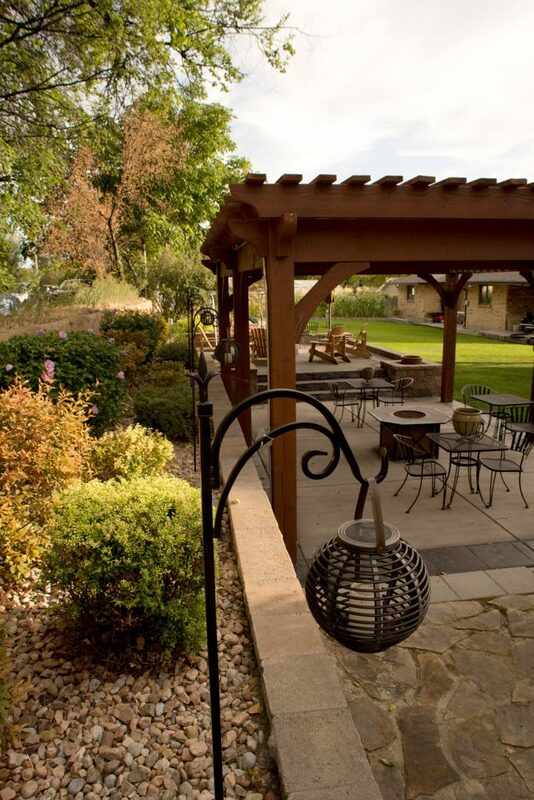 The first ShadeScape™ 8000 Series pergola kit installed over the backyard patio with fire pit, seating and dining area. 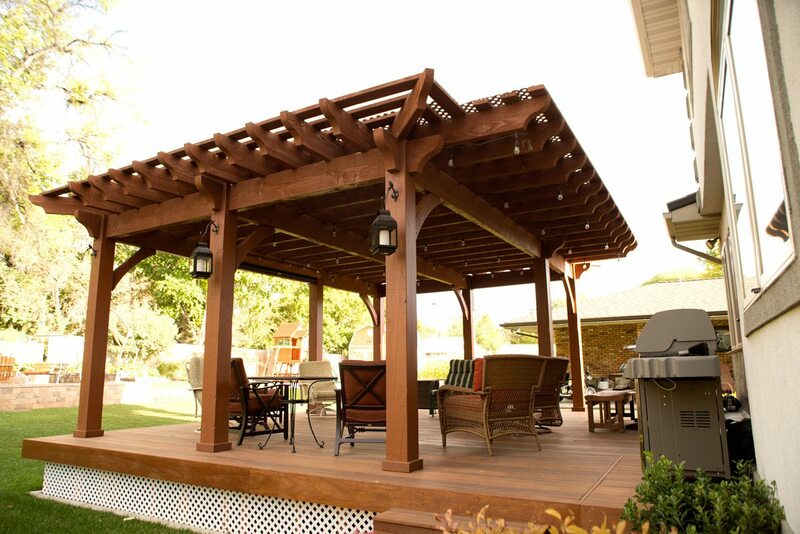 The first ShadeScape™ 8000 Series pergola kit installed over the backyard patio was already a fantastic place for the family to gather around the fire pit, enjoy each others company while dining Alfresco. 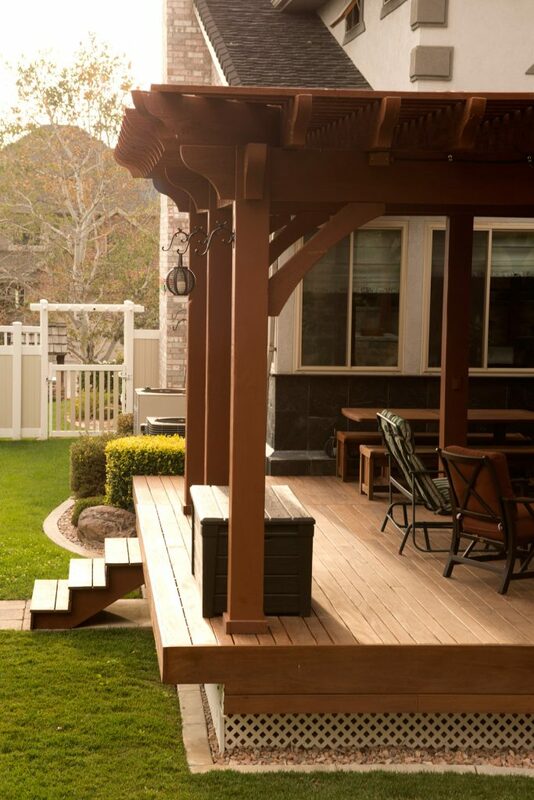 Now, with the pergola over the backyard deck only a step out the back door the family will be spending even more time outdoors.